While Monday’s New York Times, “Fed-Up Flight Attendant Makes Sliding Exit,” as well as multiple posts on Facebook applaud a distraught man’s actions, I’m left to wonder if he’s a hero, villain, or just another pained example of professional composure being hijacked by emotional infancy. Shouldn’t a true role model working as a flight attendant have used practical skills to deal with an agitated passenger? Curious, I checked in with experts at PAIRS Foundation to learn more about how the upset worker could have successfully dealt with the frustrating situation, rather than losing his cool and, possibly, his career. When someone’s walking around with a short fuse that’s ready to blow — as many saw with JetBlue employee Steven Slater — it’s probably more connected with an overloaded emotional jug than the momentary event that led to his public explosion before exiting via the plane’s emergency slide. Slater was probably holding on to personal demons of his own, whether they were layers of sadness, fear or anger. As a direct result, the passenger’s words were simply the trigger to cause the flight attendant to snap on arrival to New York’s JFK airport. Without question, Slater could have found a better way to release his negative energy. And we all can relate. Who on this planet hasn’t wanted to throw in the towel after an annoying action made by a customer, coworker or incompetent driver? 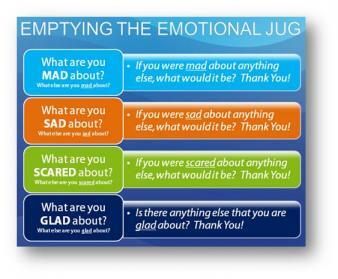 There comes a point when everybody needs to Empty their Emotional Jug. Fortunately, it’s pretty easy to relieve stress in a healthy manner, especially with a close friend or family member who’s willing to listen. And just listen. When we’re upset, the experts at PAIRS Foundation urge, what often helps most is being able to fully express all the feelings we’re carrying around with someone who listens with empathy without interrupting, trying to fix anything, or the customary pat on the back and story about how much worse it is for Auntie Sue. Each and every day, we face lots of stressors. Learning to confide, which is about both listening and talking, helps relieve energy that can otherwise lead to outbursts that can destroy careers, friendships and families. 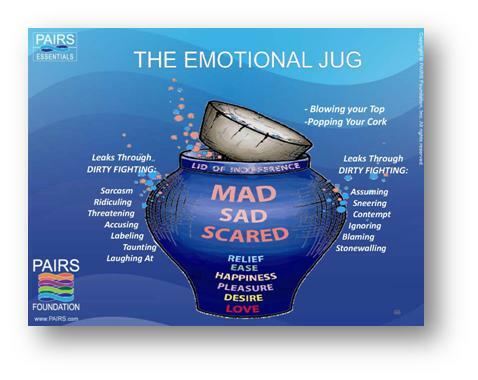 One of my favorite PAIRS exercises, Emptying the Emotional Jug, has helped tens of thousands feel better, think more clearly, and get closer to loved ones. When an adult, especially a professional, lets loose with a tantrum or tirade, it’s usually a sign that they’re not getting the support needed to release all that energy constructively. PAIRS classes teach practical, easy to use skills to deal with overwhelming stressors, including many connected to grief and trauma. One of the big differences between PAIRS and heading to a therapist is that PAIRS teaches people to be their own counselors and therapists. Beyond saving loads of time and money, the exercises also help couples better understand themselves and others, deepen bonding and connection with each other, and learn to get through the typical challenges life throws at us all at one time or another. If you or someone you care about is showing signs of being ready to explode or implode, I suggest reaching out to the people at PAIRS to learn to empty the emotional jug before reaching for a public microphone or activating the emergency gear.